New study shows that the majority of Amazonian deforestation in recent years has taken place in land owned by multinationals and large landholders, as concerns grow over increasing deforestation rates. Deforestation is on the rise again in Brazil, after a steady drop of nearly 80% between 2004 and 2011. The total area cleared in August and September this year came to more than 800km², a monstrous 190% increase compared with the same period in 2013. Furthermore, new research suggests that multinationals and owners of giant rural estates have shared most of the blame for overall deforestation in recent years. The study, carried out by the Stockholm Environment Institute (SEI) in Sweden and drawing on satellite imagery, shows that between 2004 and 2011 47.7% of deforestation in the Brazilian Amazon took place in land covered by the largest estates, in this case defined as properties with an area greater than 500 hectares (5km²). By contast, properties with an area lower than 100 hectares (1km²) accounted for just 13.9% of the total deforestation during this period. On top of this, estates with more than 1,000 hectares (10km²) of land were found to be the worst offenders of all. Furthermore, the study found that forests left standing in areas dominated by smallholder estates were generally in better shape and less fragmented than those in areas dominated by large and very large estates. It also appears that an ever-greater proportion of forest clearing is taking place in remote areas, where weaker government presence is likely allowing illegal deforestation to slip through the net in spite of government attempts to bring deforestation rates down. However, one other aspect that the study found was that the proportional contribution of large estates to deforestation was falling, with forest clearance in areas covered by these properties making up an ever-smaller percentage of overall deforestation. The reverse is true of smallholders, whose contribution to overall deforestation rates is on the rise, increasing by as much as 69% during the period studied while that of large estates fell by 63%. This is thanks mainly to the fact that deforestation in areas dominated by large estates has fallen by around 80%, but in areas covered mainly by smallholders the corresponding figure is closer to 70%. 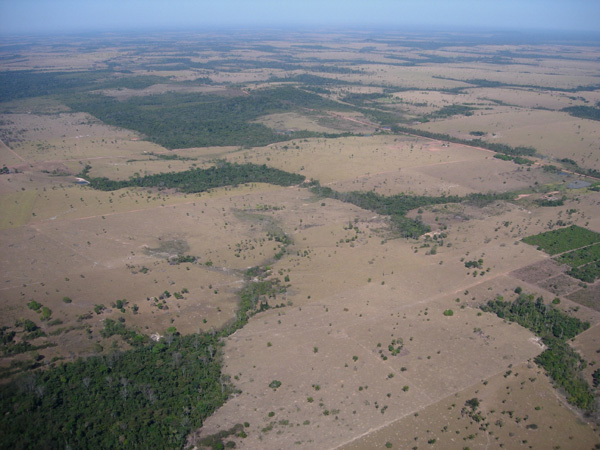 Scenes such as this, where land clearing leads to the fragmentation of forested areas, are common across the Amazon basin in Brazil. Photo courtesy of Alexander Lees via Mongabay. There are some caveats to this apparent revelation that small-scale landowners are increasingly to blame for Amazonian deforestation. First, the baseline rates of deforestation prior to 2004 mean that it was always easier for those contributing most to deforestation to see their share fall than for those contributing less in the first place: quite simply, if one group shoulders the majority of the blame, it is almost a case of ‘the only way is down’. Secondly, overall deforestation rates fell almost 80% during the 2004-2011 period largely thanks to government measures to curb forest clearance. With major logging and agricultural companies most to blame for deforestation up to then, they were the clear target for these policies, and so they were more likely to see their contributions to deforestation fall more sharply than smallholders who may have been less affected by new government-set standards. Thus, as major estates’ deforestation rates fell more sharply than those of smallholders, there would have been a change in the proportion of overall deforestation contributed by the two groups. However, with deforestation rates in Brazil apparently on the rise again since the time period covered by the SEI study, there is a danger that the measures that were keeping larger landowners and companies in check are starting to lose their effectiveness. Observers claim that farmers and loggers are starting to find ways around government monitoring of Brazil’s forests by clearing lands in blocks of less than 25 hectares. This enables them to go undetected by satellite monitoring techniques, although new satellites capable of detecting smaller areas of forest clearance are said to be on the way. The tactic is also far more likely to be used by larger landowners than by smaller ones, as the sub-25Ha blocks make up a much smaller percentage of a large estate’s total area than that of a smallholding with less than 100 hectares of land. It remains to be seen if future studies carried out when the appropriate data is available will show that the reported resurgence of Amazonian deforestation since 2012 is due more to larger estates employing these techniques, thus leading to their proportional contributions to overall deforestation rising once again while those of smaller-scale estates fall. 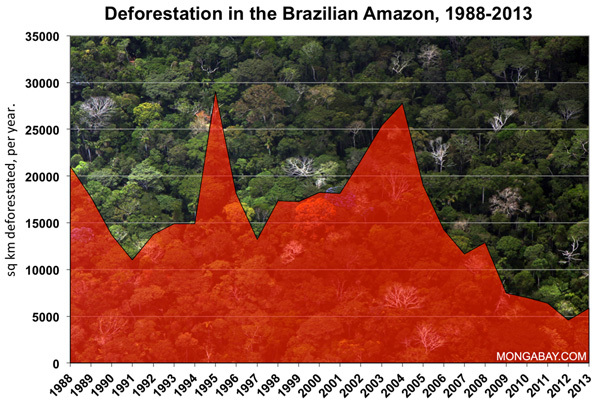 Annual deforestation rates in the Brazilian Amazon. While a massive drop since 2004 has left annual deforestation rates at the lowest levels since annual monitoring began, the rate has continued to increase again since 2012, as demonstrated by 2013 figure and subsequent partial data for 2014 released so far. Image courtesy of Mongabay. In any case, though, two things remain clear looking ahead: there are numerous reasons to be concerned about a reversal of the gains made during the last decade in bringing deforestation rates down, and equally there are calls for the rise in smallholders’ contributions to deforestation to be addressed. As far as overall deforestation rates are concerned, critics claim that the government has retreated on its earlier compromise to guarantee protection of the Amazon, with a new agribusiness-friendly Forestry Code and the scaling back of conservation schemes particularly cited as possible reasons for increasing deforestation rates. These criticisms have especially been directed at President Dilma Rousseff, with allegations that she has bowed to the interests of the agricultural lobby while pursuing a development-at-all-costs economic model, with ample government funding for new roads, hydroelectric dams and other infrastructure in the country’s interior. There are also concerns that the rising cost of cattle ranching is leading landowners to turn to other cash crops – with palm oil foremost among them – which is pushing deforestation rates up even further. As for the role of smallholders, the SEI study recommends that more needs to be done to target smaller-scale properties and reward them for sustainable use of their land, if deforestation in these areas is to be brought down further – something crucial to national efforts to meet the 80%-reduction target by 2020. The report suggests that credit and financial incentives should be provided to landowners who leave trees on their land – especially old-growth forest – standing, and that these incentives need to be specially tailored to the needs and economic realities of smallholders. Javier Godor, lead author of the study, told Thomson Reuters Foundation in an interview that “targeting smallholders with the same punitive measures used for large landowners, when they have far fewer resources, would be too costly and arguably not socially or politically acceptable”. This is a particularly important point. Not only would overly heavy-handed measures against smallholders run the risk of being counter-productive by alienating them from wider attempts to reduce deforestation; they would also have the adverse effect of putting the spotlight on these largely blameless landowners, instead of on the larger-scale estate owners who really are more responsible for historic deforestation – as the SEI study has made clear.